No artist I know ever stops observing, never stops studying. I’ve been away from this blog for a while, but I’ve been constantly working, studying. The dissatisfaction with at least one element in every finished piece always drives the next piece. 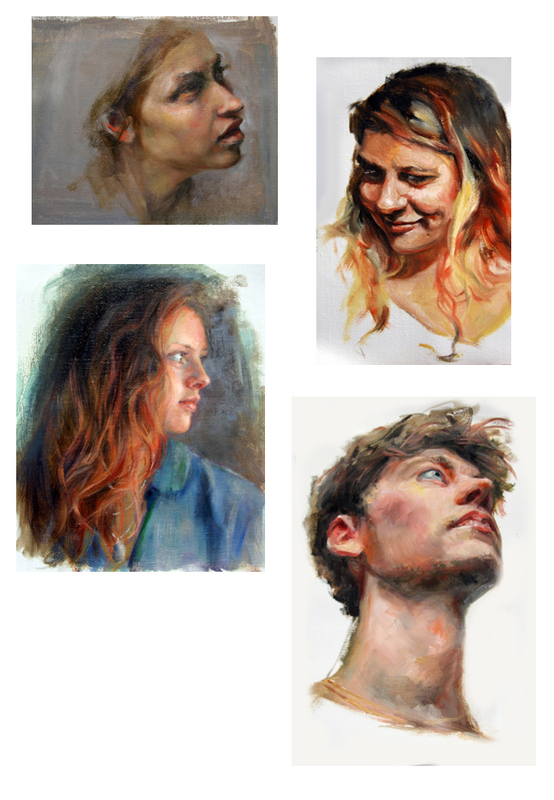 Above are a few studies I’ve been working on, trying to “fix” something that didn’t gel in a previous effort. Edges are a constant concern. Softening, firming or losing them in a back round. It’s something I’m always pondering. Transitioning of values from one passage to another, is another thing I’m constantly thinking about. Dramatic lighting changes up the way I think about edges and transitions. And color often runs away with my intentions. One piece that I was pretty happy with (“Tommy”) when I finished it, was awarded sixth place in the Portrait Society of America’s Members show in the Non-Commissioned category. I’m thrilled, humbled and very excited! 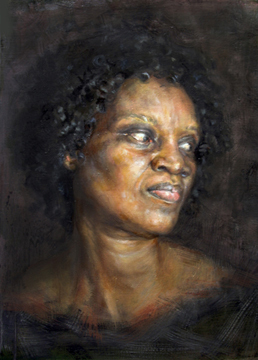 Click on the “Portrait Society” link and enjoy all of the excellent work! These are beautiful paintings, Elena. Your work is stunning, Elena. Congratulations on your show. You are very kin, Jane. Thank you. Beautiful as always, and congrats. The quality of your work shows you’ve been studying/observing for a long time – I’m sure you can’t be awake without doing that (same with writing). Good to see your art again (I disappear from my blog for long stretches too). Hey James, Good to hear from you. You’ve got it:) Thank you. A wonderful set of expressions, Elena, and I’ve already mentioned how much I love Tommy. Congratulations!! Congratulations Elena on placing! Well deserved! I’m a huge fan of your work and can’t wait to see you post your newest creations soon. Hi Elena! So nice to see your posts again!! I thought you had left WordPress. Hope to see your fabulous art again! 😀 Loved all your pieces too!! No, I’m still hanging in. Just otherwise engaged. So lovely to have you visit. You know, even though I’m not actively posting or visiting blogs, I think of all my blogger friends often. Thank you, Anita! Great to see your work again, Elena! Have a great 2017! Thanks, Richard! Happy New Year to you as well! Congratulations Elena! Great way to end the year with all your hard work. I think I remember gushing quite a lot over that one when you posted it, it’s a fabulous painting.. Many thanks, Kath! Good to hear from you. Happy New Year! I love your ability to capture expressions, Elena. Congratulations! Your work is so beautiful, Elena. Breathlessly so. Sorry for the delay in posting this. But it’s awesome work! So nice to see you, Tom. Thanks for visiting! Wishing you the best of the Season! My talented blog friend…. I adore your work!!!! Thanks so very much, Resa!!! Pure fabulousness all through!!! Great attitude, approach, and as always, gorgeous work that results from your constant, intelligent, and passionate work. I continue to stand in awe of you. It’s good to see you back Elena and to renew acquaintance s with your portraits. Many congratulations on your award for Tommy. I’m delighted for you but not surprised by your success. Tommy is a fine portrait at many levels and you fully deserve the recognition. Yay! so glad to see your new works, or do you call them inspiriations expressed? Sounds like a better title than the one I have:) Thanks, Elisa! Inspiring post! Congrats on “Tommy”, it’s a brilliant painting. I like what you say about growing all the time, even when you’re not blogging or active online. Lots of work is being done behind the scenes, and that comes through when you do decide to post, which is always a treat. Yes, this could be a cover:) Thanks, Chris! Hi, Elena, Missed you for a while; you might have missed my blogswitch. The new one is: https://harrienijland2.wordpress.com ; blue follow-button on the right side, just in case… Hope to see you there. I liked Tommy first time. I still do. this is great collection, Elena! Thumb up!!! Searching and exploring new ways are inevitable luggage of the artists ; if not mediocrity remains only… I really like it! I can tell you that observation is what comes across in these examples. I’m reminded of they way Leonardo used sketches. I’ll take any sentence that includes Leonardo having anything at all to do with my marks. Thanks so much, Marie. Great to see you’re still going strong! Till I can’t:) Thanks, Robin. I can’t keep up with blogs, FB etc. so I’m very glad to enjoy your gorgeous work in Instagram. Congratulations on Tommy! That’s such a great piece! Nice to see you’re still at it! Looking good! I’ll be doing until I can do anything any more:) Thanks, Kevin! Stunning paintings as always, Elena. Congratulations on your recognition in that competition. Well deserved. The eyes are completely compelling. Thanks ever so much, Laura. I’m so happy to see these, they are so expressive. I think you do edges and values so well. OMGosh! Just been to your blog and so many congratulations are in order-your marriage, your writing and new blog! I had trouble leaving a comment on your blog, but hope you see this. My very best!